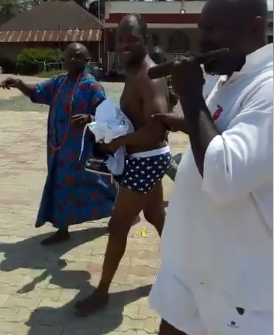 A video is making rounds on social media showing a Germany based Nigerian man, Murphy Idahosa, banished from Edo state over a video he posted on Facebook a while ago attacking the person of the Oba of Benin. In the video, Murphy was seen blaming the Oba of Benin for the high rate of trafficking among girls in the Benin kingdom. He however returned home recently and was taken to the Oba’s palace where he was declared an enemy of the Oba and then banished from the kingdom. Germany based Nigerian man, Murphy Idahosa, banished from Edo state after insulting the Oba of Benin on Facebook. Swipe to watch video of him attacking the Oba on a video he posted on Facebook a while back. Eddy Murphy declared an "Enemy of the Oba"
Eddy Murphy allegedly clears himself as not been declared an "Enemy of the Oba"We all will recall this man, Eddy Murphy who calls himself President of Social Media was allegedly said to have sat in his living house in Germany and was disrespectfully talking about the Palace.The Oba of Benin is truly merciful, we can see Eddy Murphy been escorted from the palace without been physically touched, he has been saying that video was an edited work and that he never said any derogatory statement towards Edo, even when people thought the Benin youths will not be easy on him, he still was never manhandled.